(Middle East, 22 July 2015) Mulliner, Bentley’s specialist bespoke department is taking luxury and performance to new extremes with the launch of the Continental GT Speed Breitling Jet Team Series. This exclusive series is available in the USA and is limited to just seven cars, each inspired by one of the seven Breitling Jets. Renowned for their precision, speed and daring stunts, this summer the Breitling Jet Team will be performing across the United States and Canada in a grand tour of epic proportions. 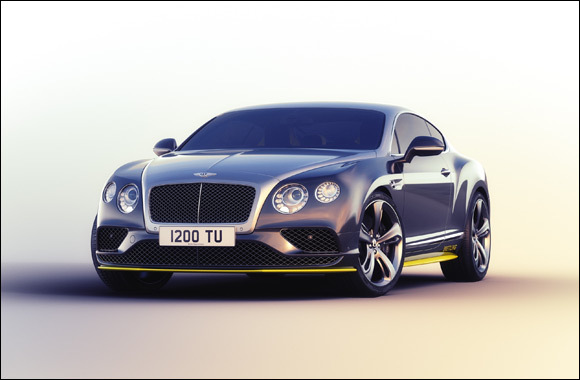 To commemorate this spectacle, Bentley’s Mulliner division has re-imagined the Continental GT Speed to mirror the distinctive look of the Breitling Jets, fusing extreme customisation with immense speed. The exterior is painted in a striking duo-tone split of Hallmark and Onyx with highlights colour matched to the exact Pantone of Breitling’s unique Yellow, reflecting the trademark look of the L-39 Albatros Jets. This bespoke colour theme is continued on the interior, with unique sculpted seats featuring accents in Breitling Yellow. Taking customisation to new heights, each Bentley is individually numbered and corresponds to one of the seven Breitling Jets. The dashboard’s carbon fibre fascia panel displays an image of the seven planes in their signature Avenger flight formation, with the corresponding jet highlighted in Breitling Yellow. Similarly, Bentley's Mulliner team have matched the hide and thread to Breitling’s signature yellow and designed a series of logos and graphics for the headrests that highlight the number of each car and the jet that inspired it. The tread plate plaques are also individually numbered. The series will debut at the Boeing Seafair Airshow on 31st July in Seattle, where the Breitling Jet Team is performing. The key for each Bentley will be handed over to its owner by the corresponding plane’s pilot, but not until they have experienced a flight in the jet that inspired their car. Bentley Mulliner Limited Editions are rare by design and, as a result, they all have the potential to become instant classics, desired by many but driven only by a fortunate few.